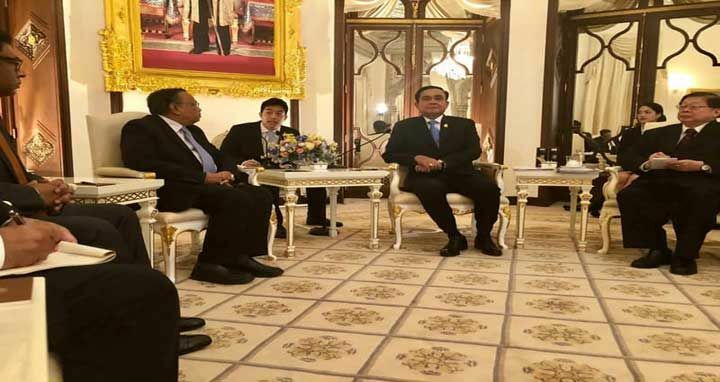 Dhaka, 15 Mar, Abnews: Thai Prime Minister Prayut Chan-o-chaon on Thursday termed Bangladesh a ‘gateway and connectivity hub’ between South Asia and South East Asia and offered to establish coastal shipping connectivity between Thailand’s Ranong Port and Bangladesh’s Chittagong Port. He proposed that Bangladesh’s ‘Look East Policy’ and Thailand’s ‘Look West Policy’ may be synchronised to create new trade and economic connectivity corridors and offered to establish coastal shipping connectivity between Thailand’s Ranong Port and Bangladesh’s Chittagong Port. The Thai Prime Minister pledged his full support for Bangladesh’s bid for membership in Mekong-Ganga Cooperation Forum and the Asean Sectoral Partnership. These issues came up for discussion when Foreign Minister AH Mahmood Ali met the Thai PM at the Government House in Bangkok, according to Bangladesh Embassy in Bangkok. “Bangladesh and Thailand are longstanding friends and connected by the Bay of Bengal and maritime routes, we should intensify cooperation in trade, investment and regional connectivity,” underlined Prime Minister Chan-o-cha. He congratulated Bangladesh for assuming Chairmanship of the OIC and looked forward to working closely with Bangladesh as an OIC observer. Chan-ocha also proposed to create institutional framework with Bangladesh on security cooperation to prevent transnational crimes in the region. Foreign Minister Ali thanked Thai PM for all his pledges of support and assured him of Prime Minister Sheikh Hasina’s full cooperation in advancing Bangladesh-Thai trade, economic and connectivity cooperation. He offered Thailand a dedicated Economic Zone for Thai investors and all-out support to Thai companies that have invested in Bangladesh. Foreign Minister Ali is now in Bangkok on a two-day visit to Thailand at the invitation of his Thai counterpart to inaugurate the Bangabandhu Chair at Thailand’s leading technology institute - Asian Institute of Technology (AIT). Power, Energy and Mineral Resources State Minister Nasrul Hamid, Sheikh Hafizur Rahman, Member Secretary of Bangabandhu Trust, senior officials of Prime Minister’s Office and MinistryForeignAffairs and Bangladesh Ambassador to Thailand accompanied the Foreign Minister at the meeting. The Thai Prime Minister also expressed their willingness to work with Bangladesh on framework cooperation MoU on Energy sector. Both the Thai Prime Minister and the Foreign Minister expressed satisfaction that the bilateral trade marked a growth of 33 percent last year and hoped that the momentum will continue to double the trade figure by 2021. Both of them agreed to strengthen cooperation under Bimstec framework. To facilitate the bilateral trade, Mahmood Ali reiterated Bangladesh’s request for duty- and quota-free access of 36 items from Bangladesh. He invited more Thai investment to Bangladesh, particularly to tourism and agriculture sectors. The Thai Prime Minister congratulated Bangladesh on assuming the chairmanship of the OIC and expressed willingness to work with the Muslim world as an OIC observer state. Minister Ali updated the Prime Minister about the Rohingya crisis and sought Thailand’s engagement with Myanmar for sustainable return of the forcibly displaced Myanmar citizens. He also thanked the Prime Minister for Thailand’s humanitarian assistance to the tune of US$ 40000 through UNHCR for the Rohingyas and Thailand’s position in the international forum on this issue. The Thai Prime Minister committed further support of US$ 100,000 through UNHCR and wished the repatriation process agreed between Bangladesh and Myanmar. Foreign Minister Ali is scheduled to hold bilateral talks with his Thai counterpart at the Ministry of Foreign Affairs of Thailand later Thursday.